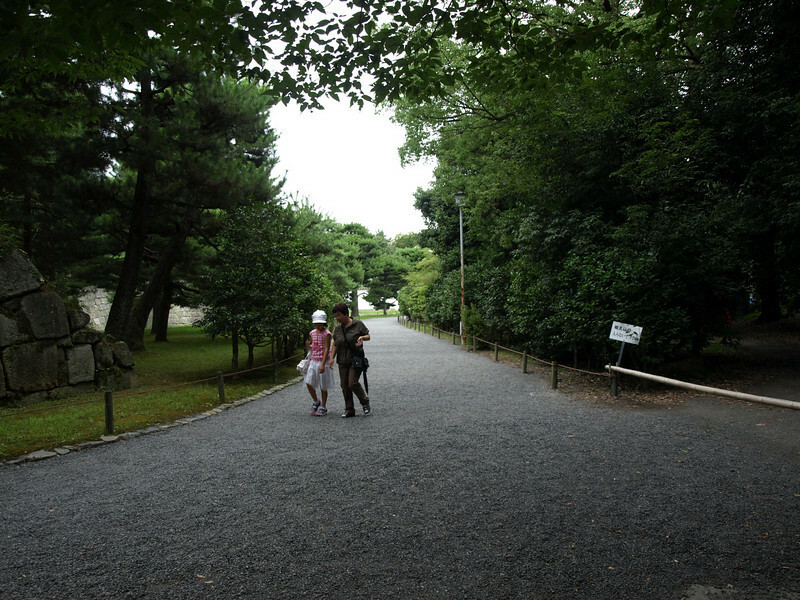 Beyond this gate is the bridge. 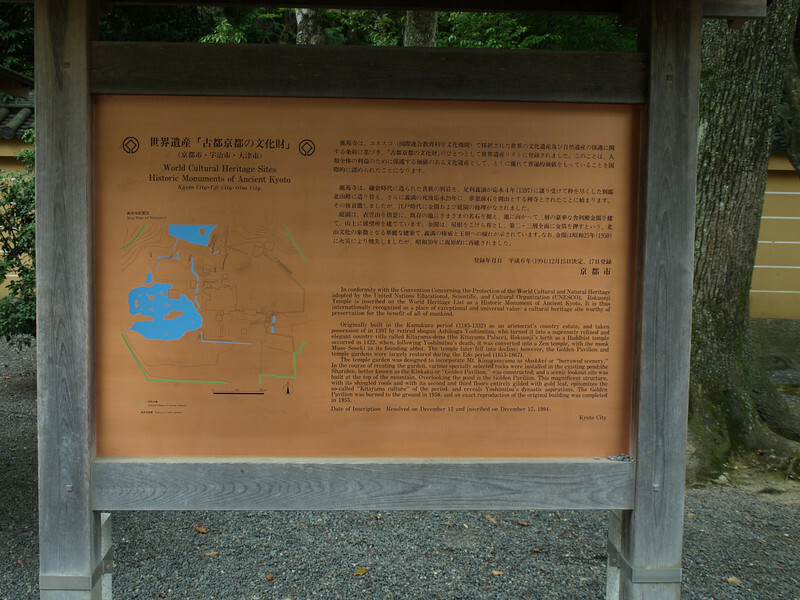 We're currently at the top middle section of this map, having just crossed the moat. 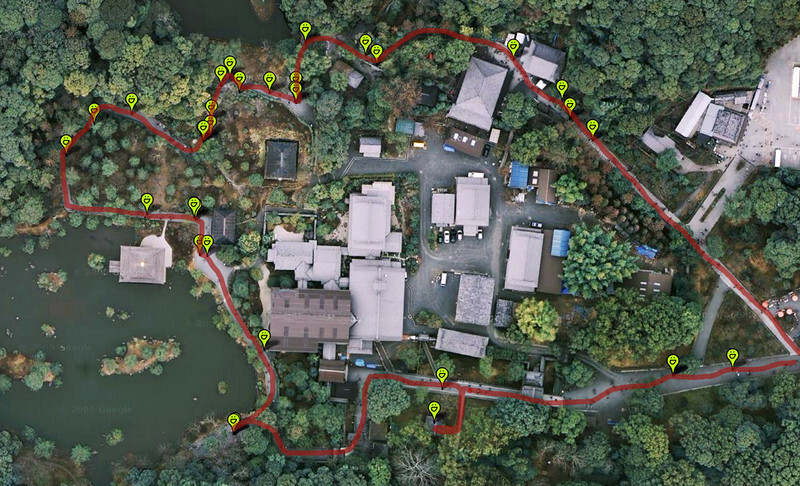 We've walked about a half-mile over the last 30 minutes or so. 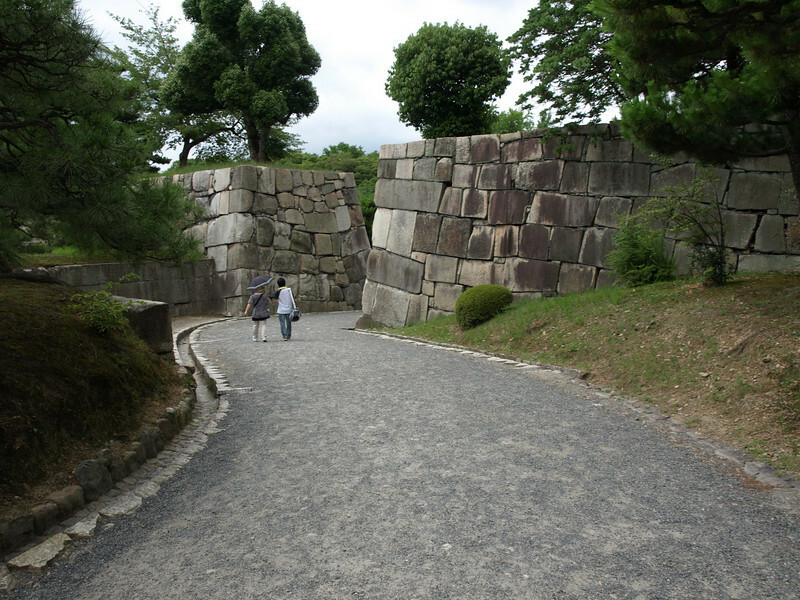 A view along the west (rear-most) section of the inner moat showing the East Bridge that we just crossed. 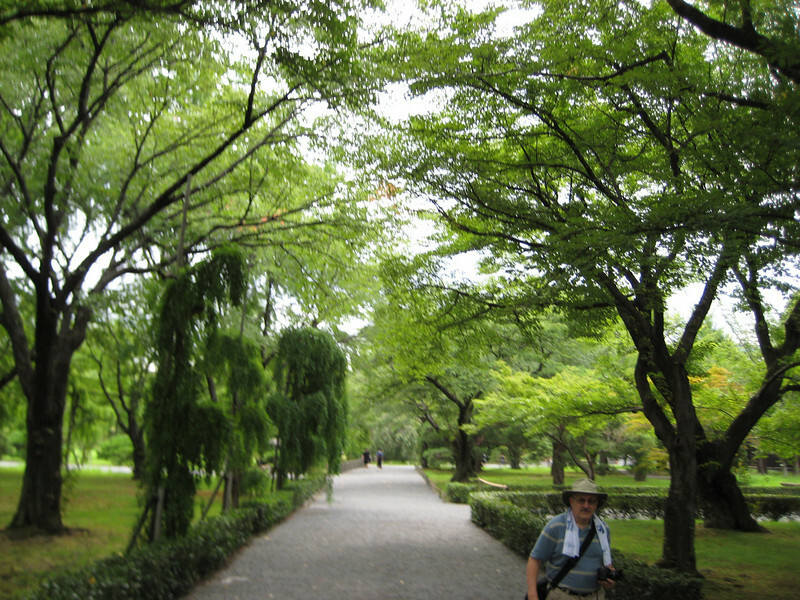 Walking back to the front of the complex. 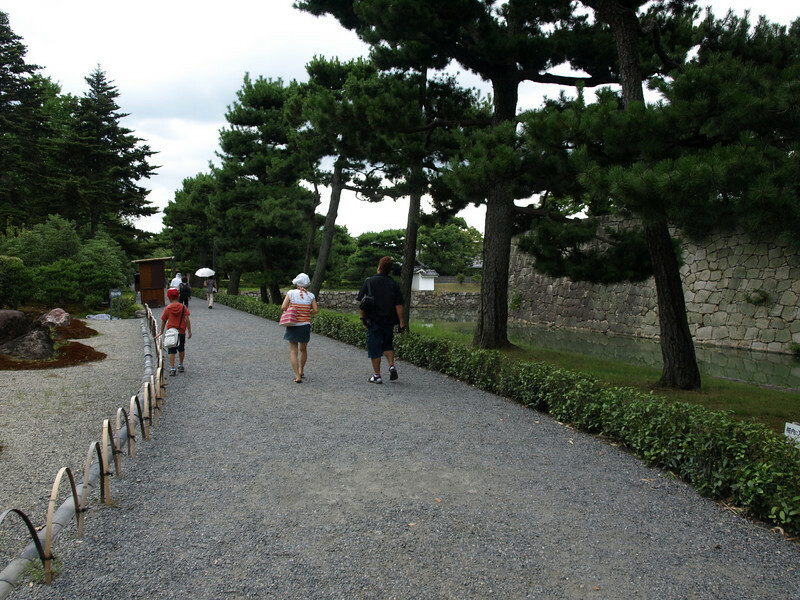 Note the inner moat off to our right. 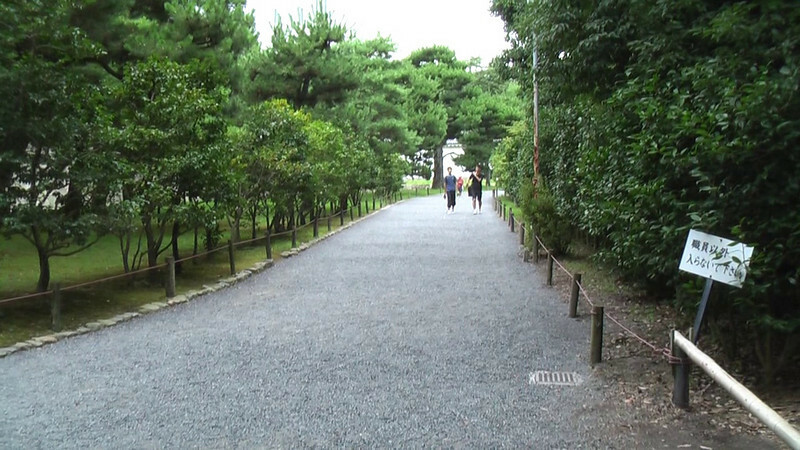 A short video of us walking along the gravel path heading back to the front of the castle. 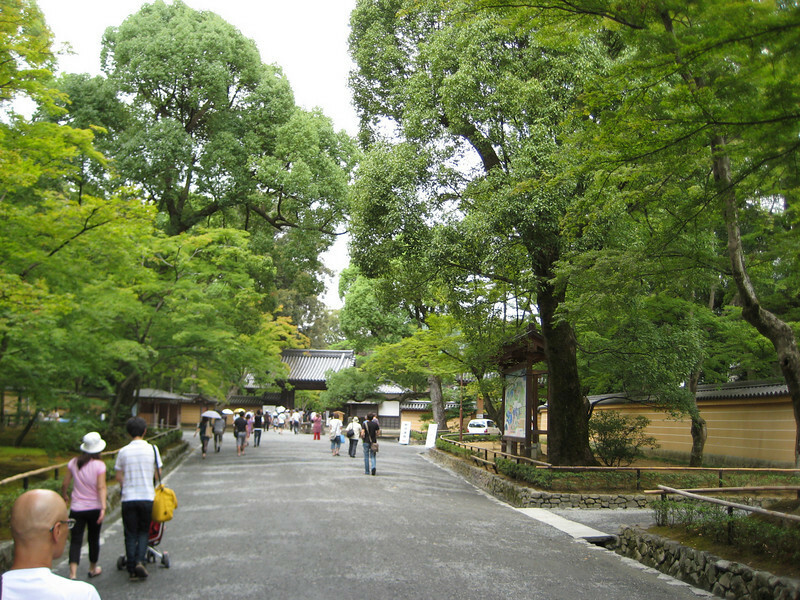 This is called the North Nakashi-kirimon Gate. 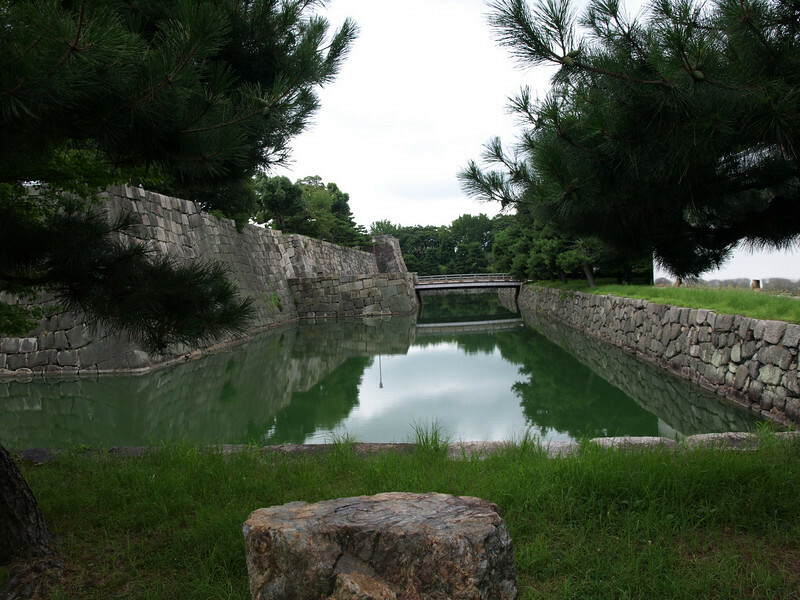 You can see the wall of the inner moat through the opening. 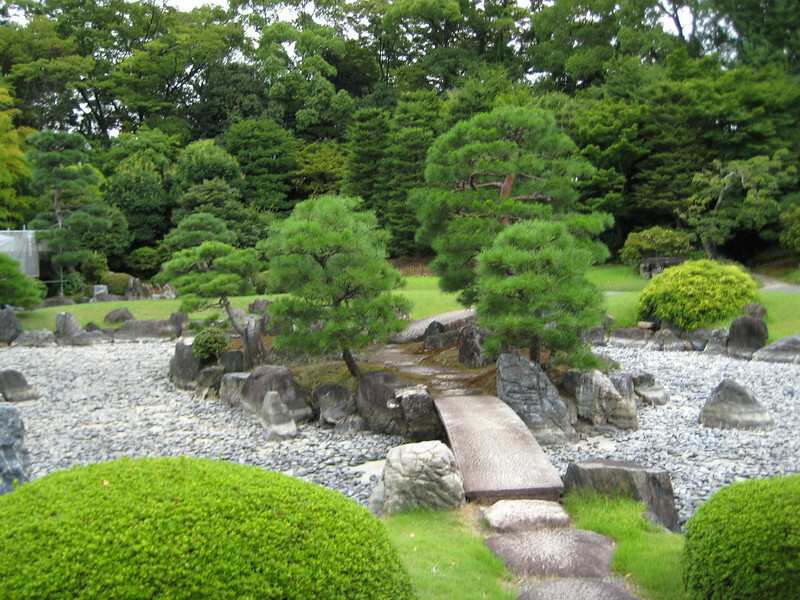 Continuing our walk, rock garden to the left, moat to the right. 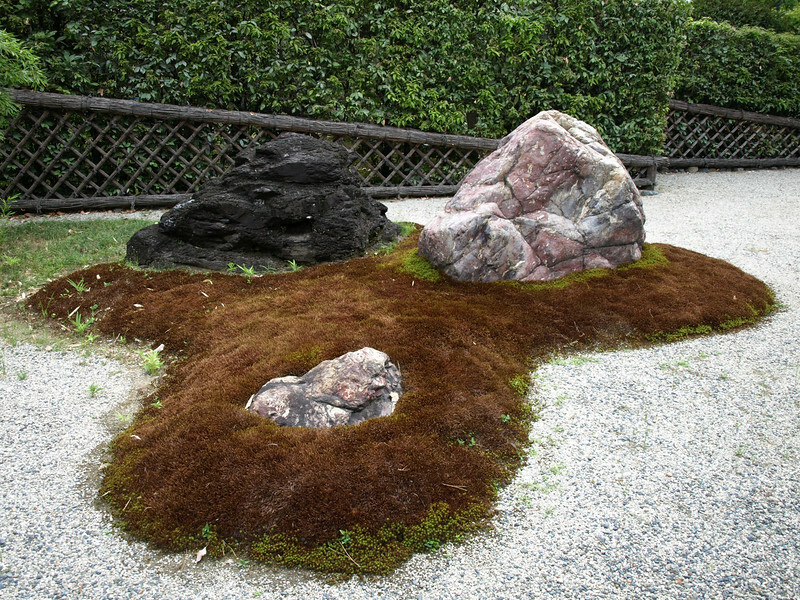 A detailed explanation of this particular rock garden. 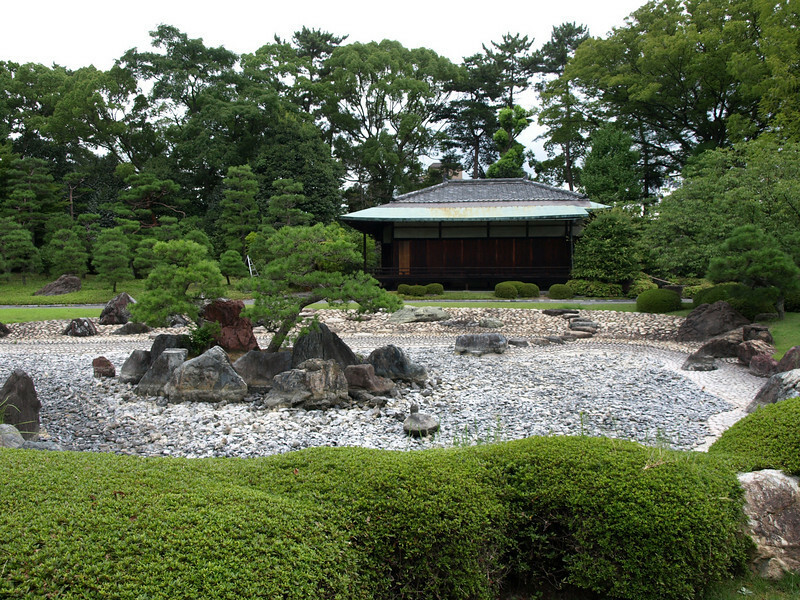 The Seiryuen Garden is a recent addition to the Nijo Castle, most recently landscaped in 1965. 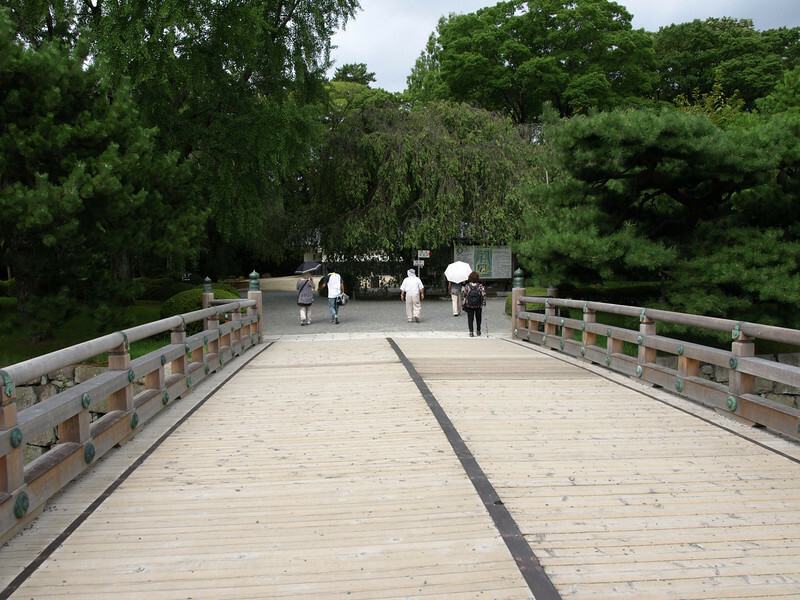 Normally filled with water, this small bridge allows one to cross to the island and then on to the other side. 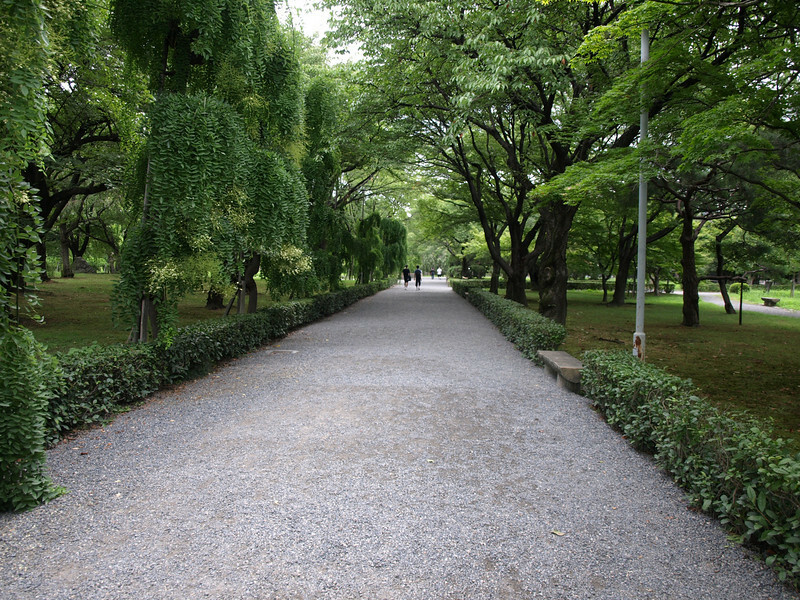 Back on the main path, we continue our walk back to the entrance. 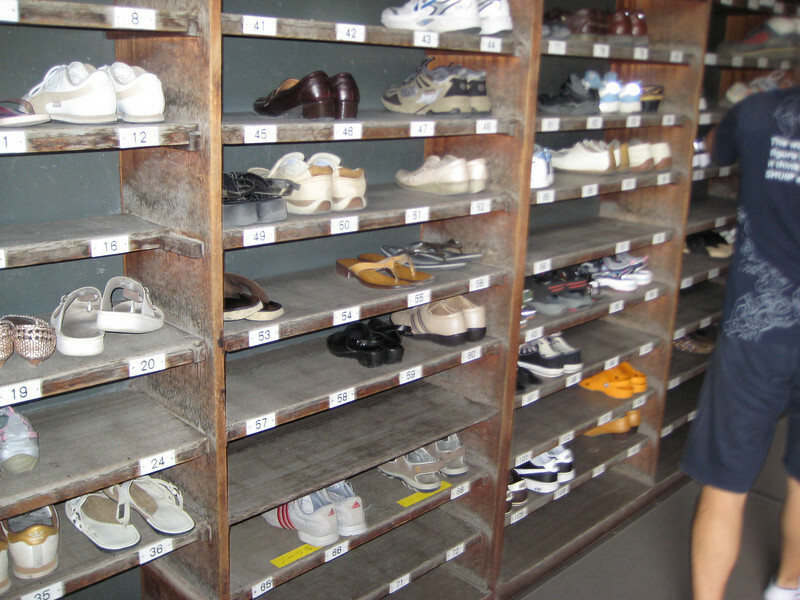 Inside almost every home in Japan is the genkan, a foyer sort of area where you remove your shoes in order to keep from tracking dirt into the home. 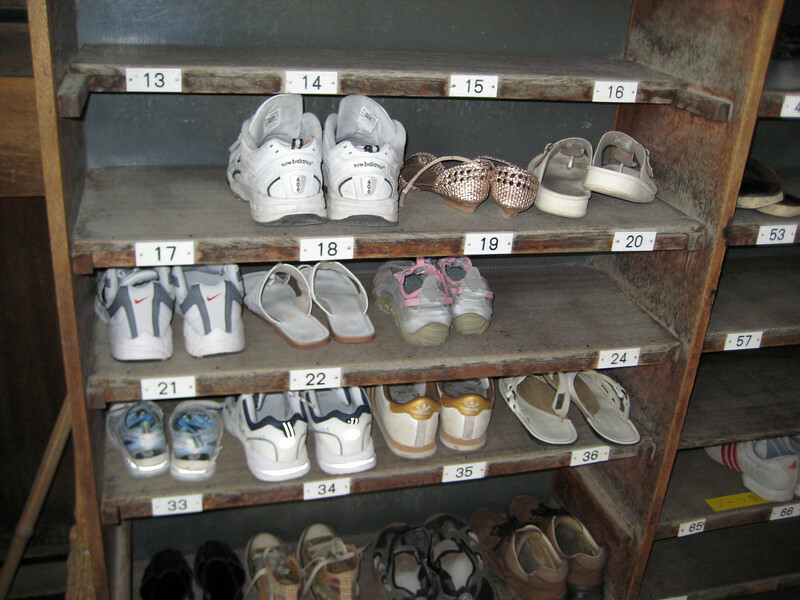 The getabako or shoe rack where we will keep our shoes. Josh's tennis shoes are in slot 18 and mine will join his shortly in slot 17. 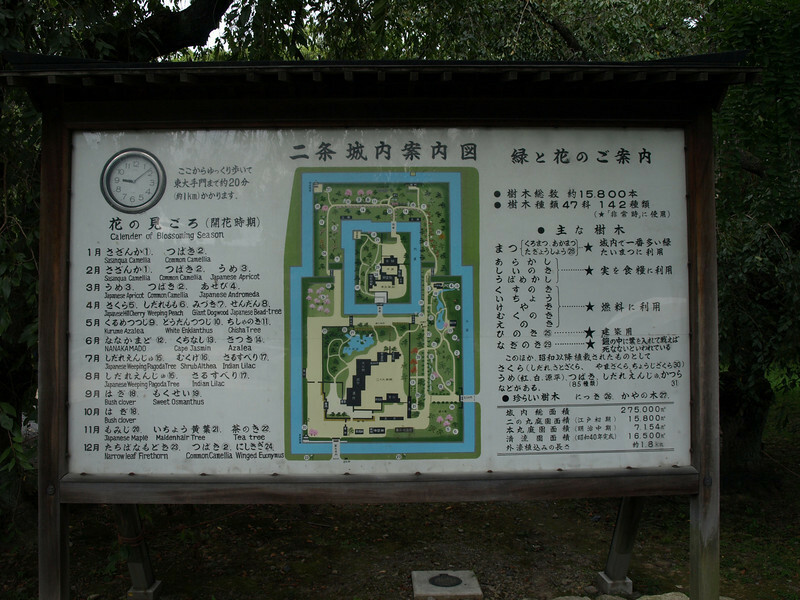 Photography was not allowed inside the palace, however here is the floor plan. 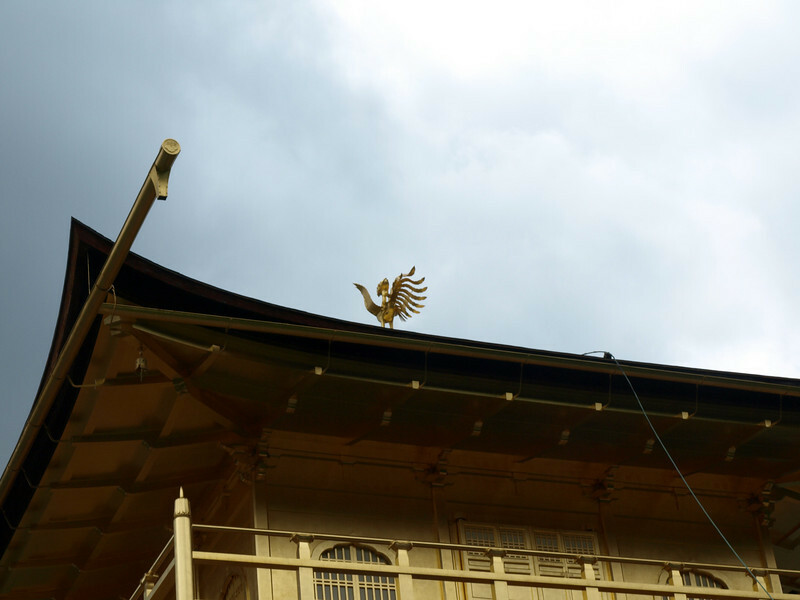 Every one of the rooms in the castle has a formal name, but I’ll only address a few of the important ones here. 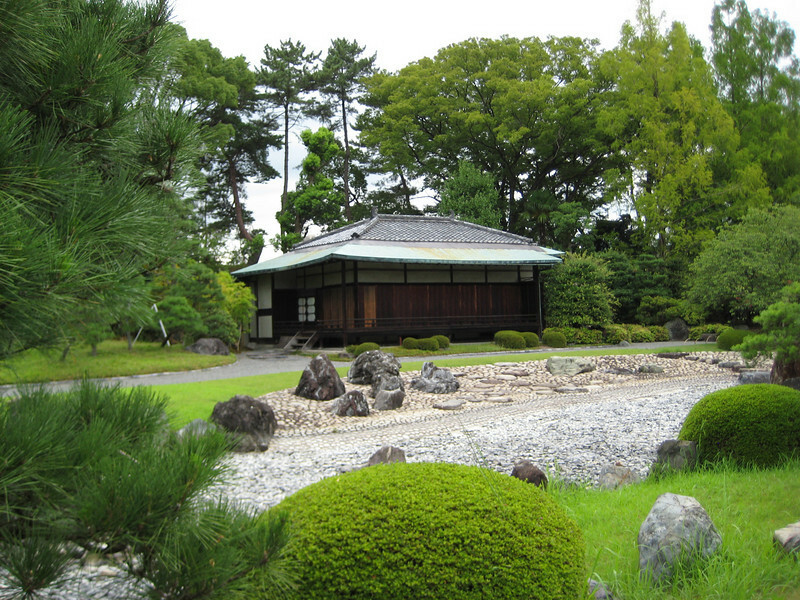 1) The Yanaginoma (Willow Room) and, above it, the Wakamatsunoma (Young Pine Room). 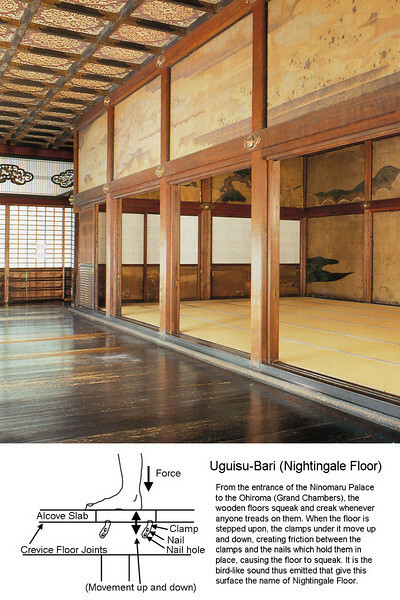 These rooms were used by inspectors to verify the identities of visiting feudal lords. 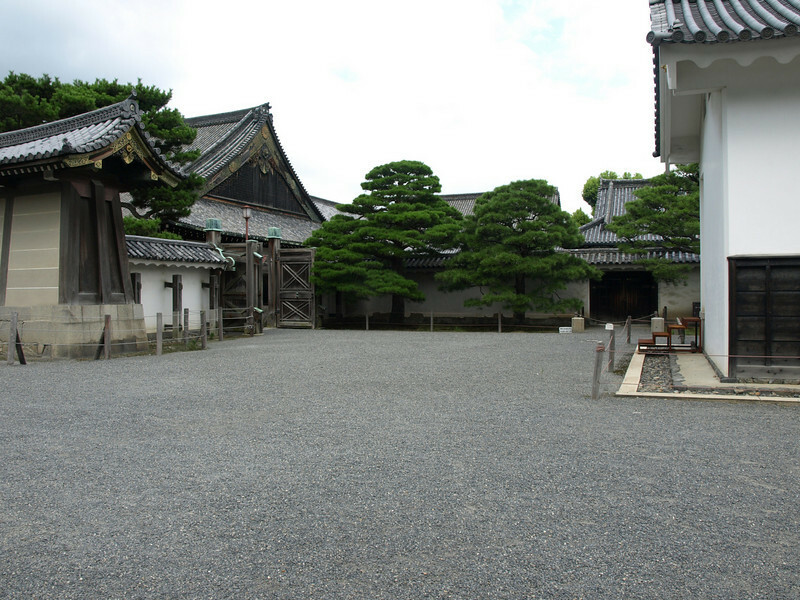 2) These three rooms are called Ichinoma, Ninoma and Sannoma (literally First, Second and Third room) and were used as waiting rooms for the visiting feudal lords. 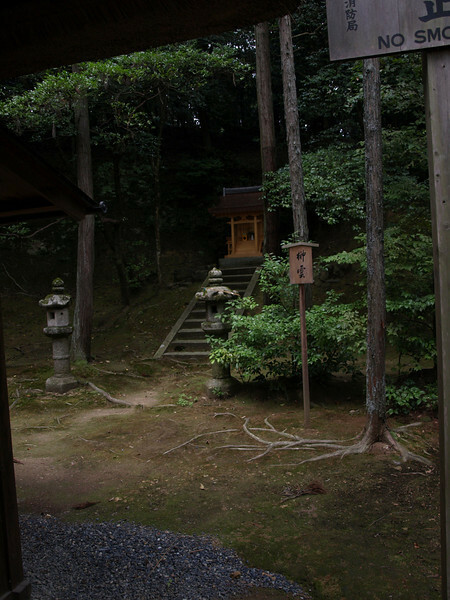 3) The Chokushinoma chamber was the waiting area for the Imperial Messenger prior to his meetings with the shogun. 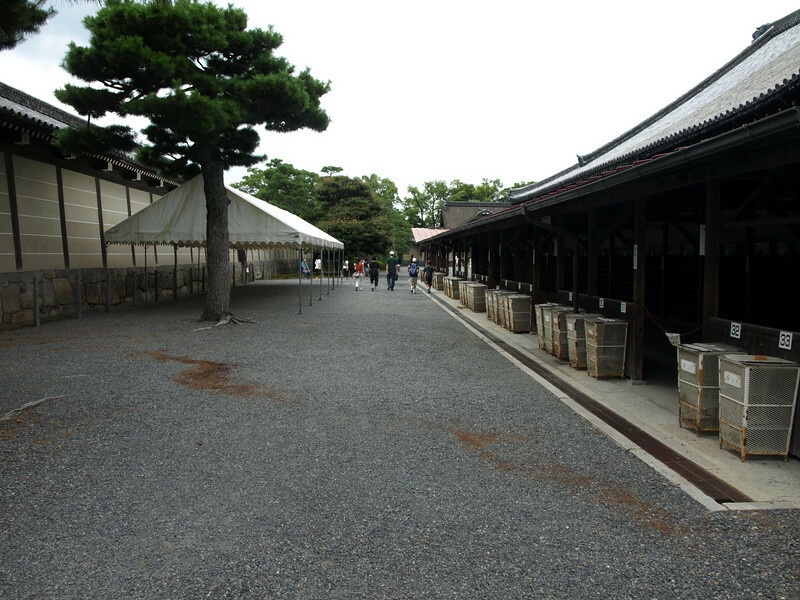 4) The Shikidai reception room was where visiting feudal lords would offer their greetings and gifts to the councilors stationed here. 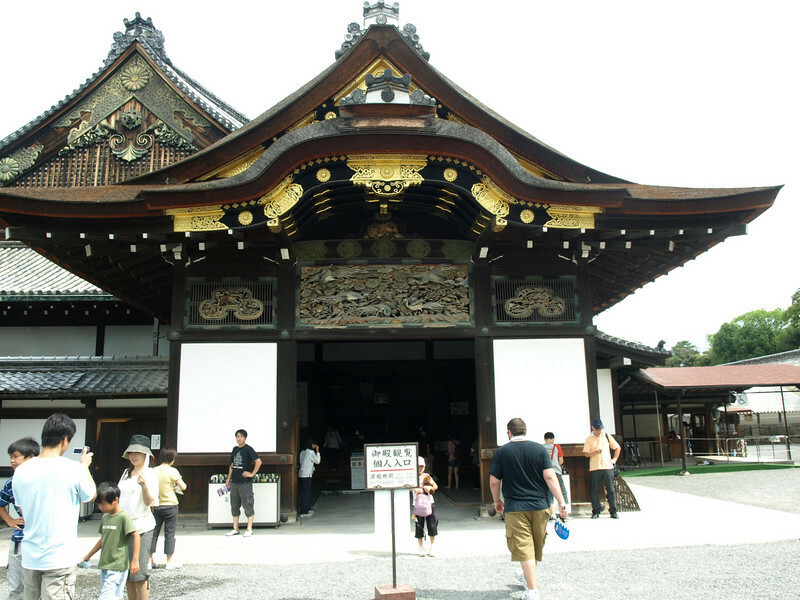 5) The Ichinoma and Ninoma form the First and Second Grand Chambers in the Ohiroma building where the shogun would hold public meetings with the feudal lords. 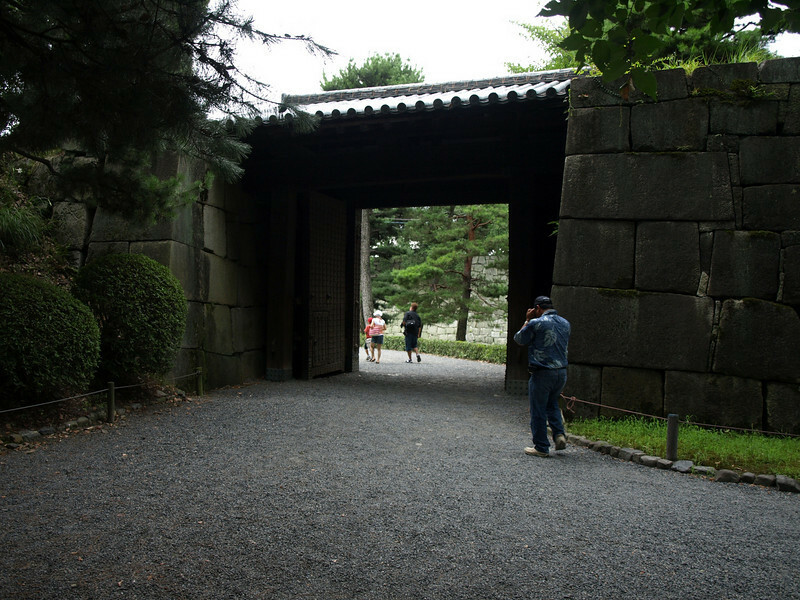 6) The Yarinoma (Spear Room) allowed storage of weapons and where warriors could be hidden in case they were needed to protect the shogun as he hosted the public meetings. 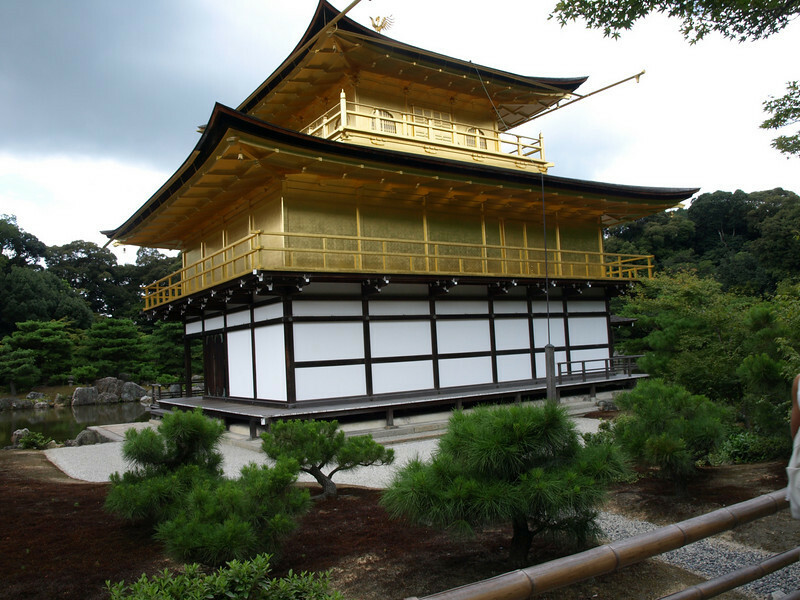 8) And finally, the inner-most Shiro-shoin was the shogun’s private study and bedroom. 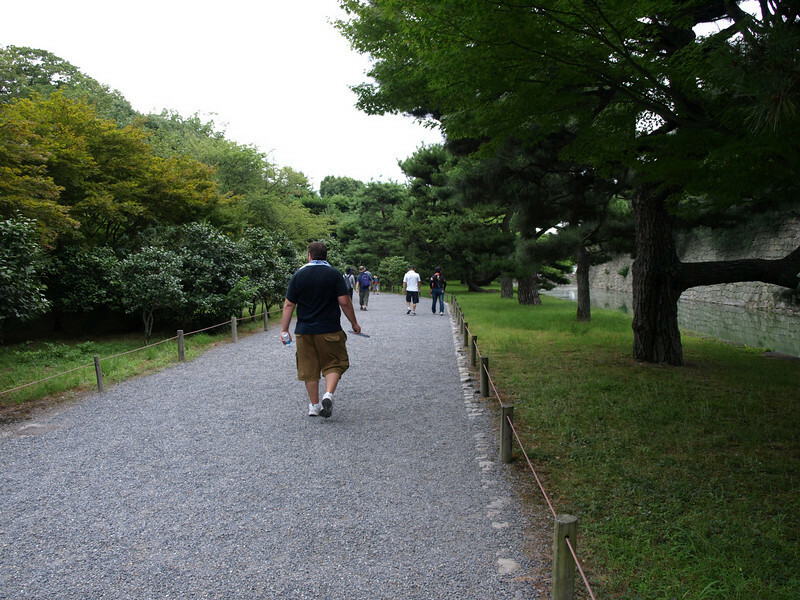 As Josh and I walked through the halls, we were able to experience firsthand the nature of the nightingale floors. 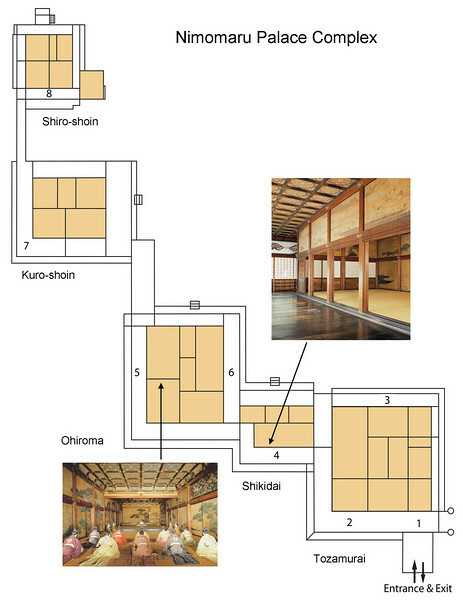 As noted in the diagram above, the floors work by the squeaking of the nails and clamps as they rubbed together due to the foot pressure applied to the floor panels. 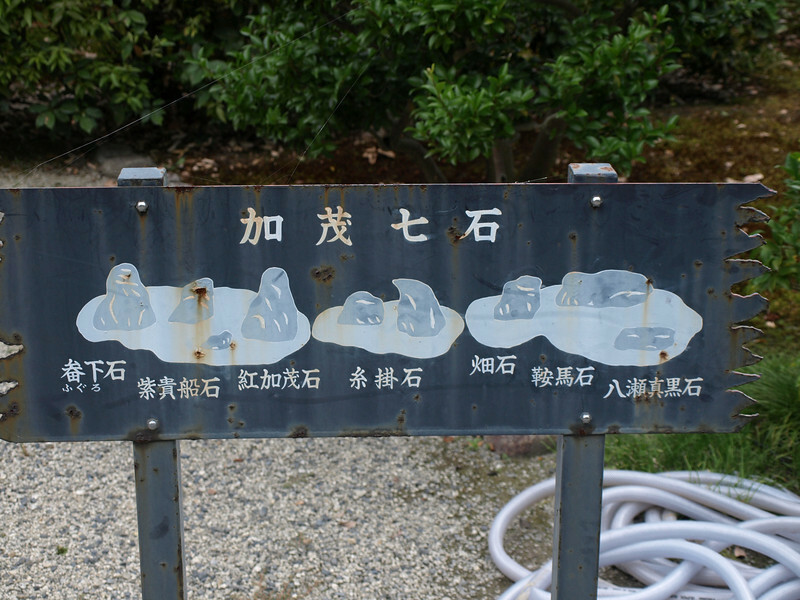 No matter how softly you attempted to step, the boards would announce your presence. 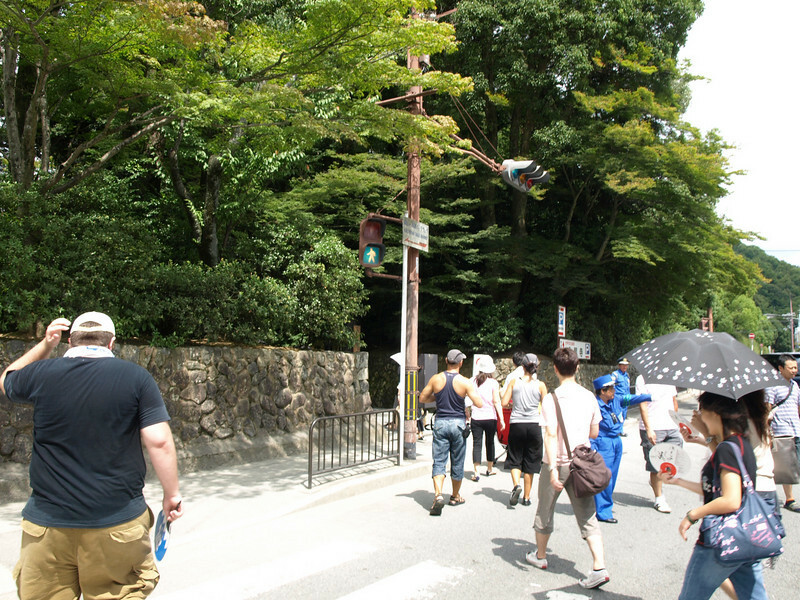 By now traffic was heavy and the buses were crowded. 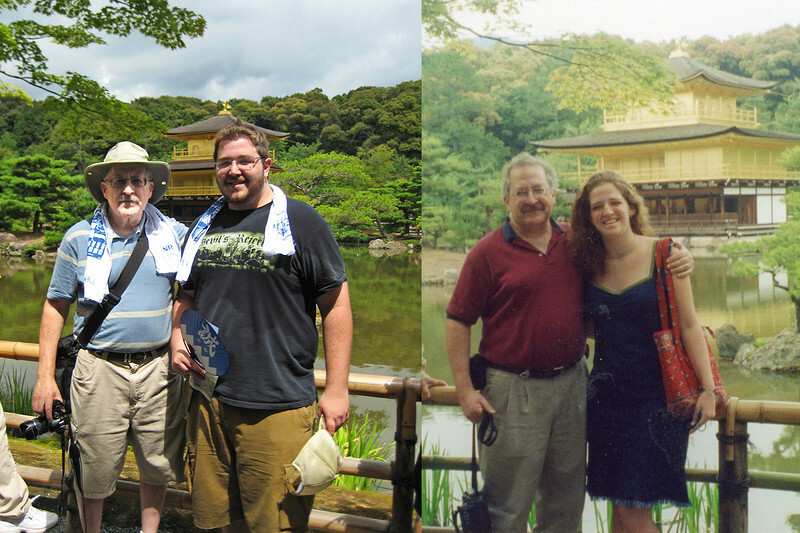 Josh and I had to stand in the center aisle between the seats as we rode to our next stop. Apparently there are no rules about bus capacity and people will crowd on even if there is the tiniest amount of free space. 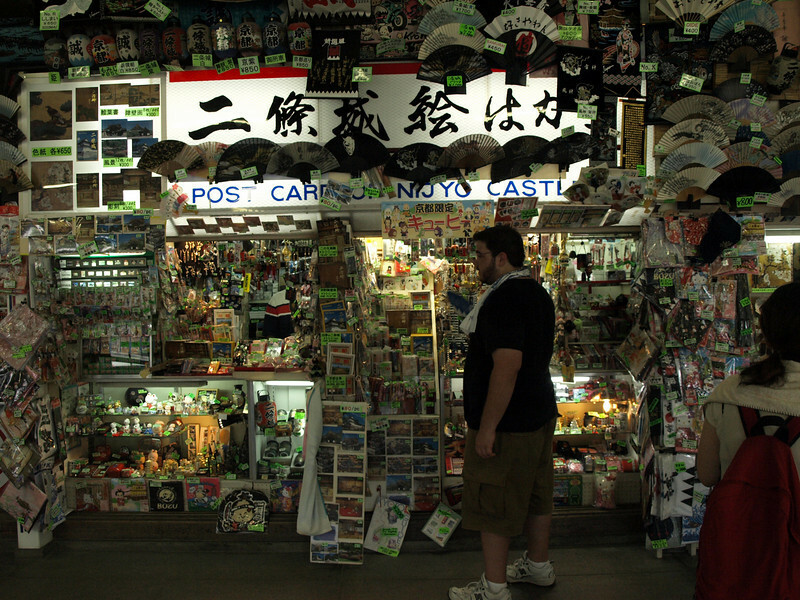 I figured at one point that we had surely reached critical mass when I saw the true gift of Japanese packing as a family group of maybe 10 people jammed on behind us. At this point, any significant movement was impossible until some folks unloaded. I was so amused by the sight of this small girl who was crowded against Josh’s legs. She slowly looked up and up and higher yet as she craned her neck back until she finally saw the top of Mt. 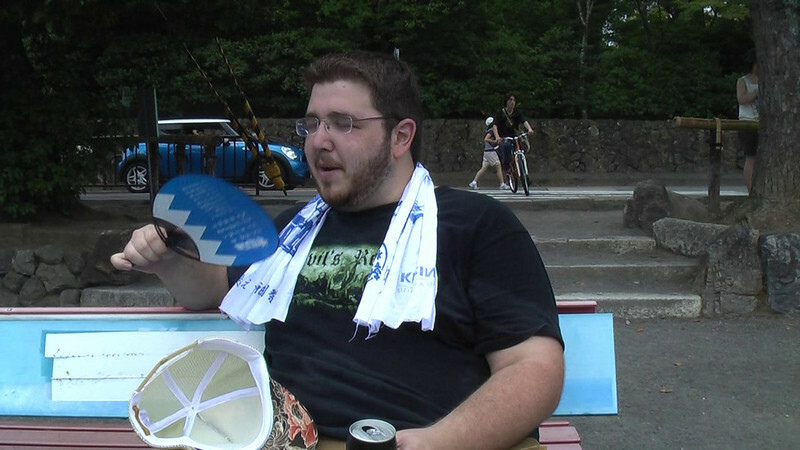 Fuji that is my son. Instantly, she shot her head back down and quietly stood there, meekly staring at her feet, until we disembarked. 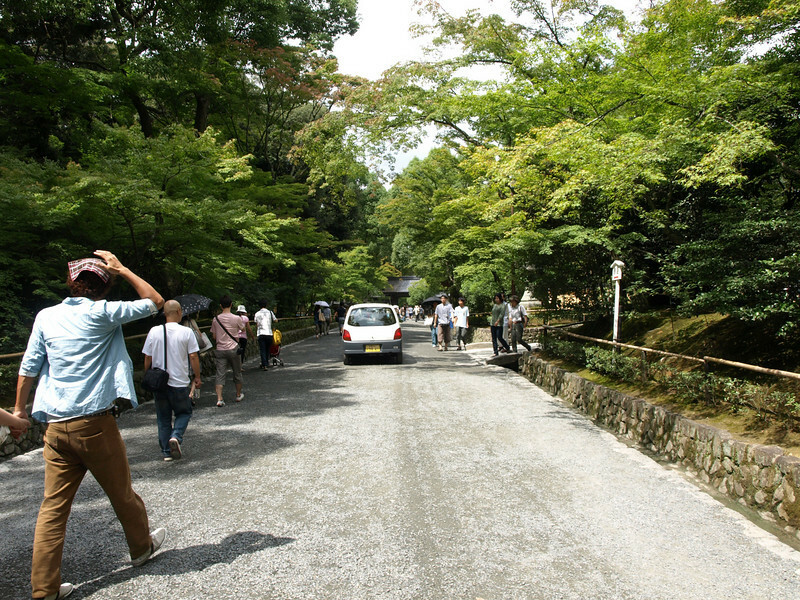 Maybe it's just a guy thing, but the Japanese men appear to love to take relief outside. 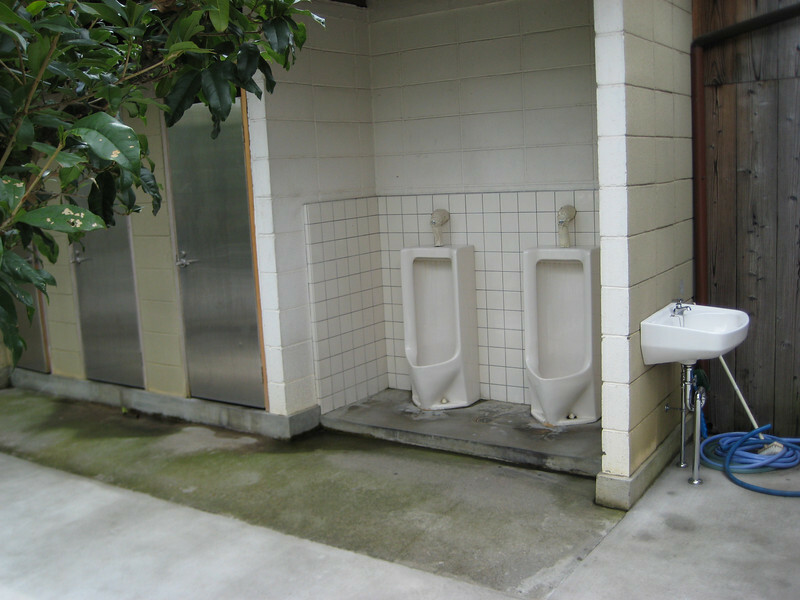 You’ve got to admit that it is convenient. We're right about where the red arrow and sign is located. 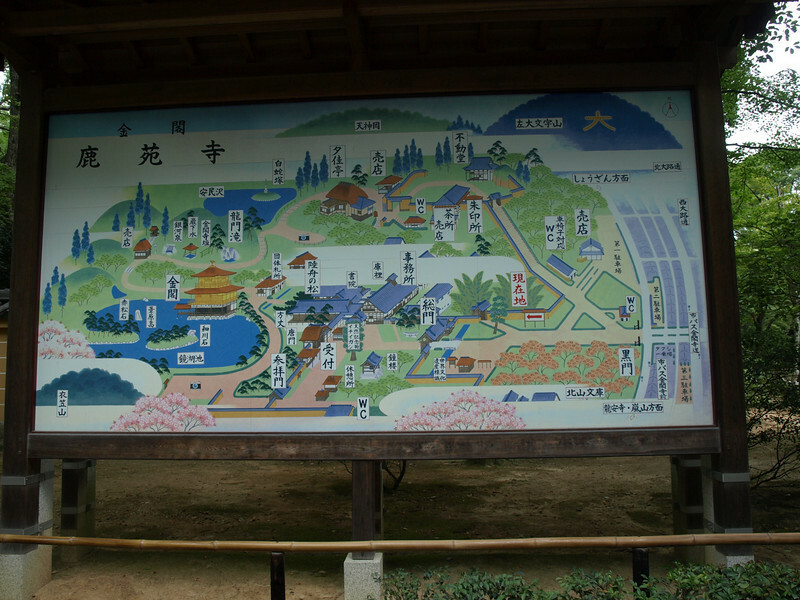 This overhead illustrates our geotagged photos along with the mile-long route that we took. 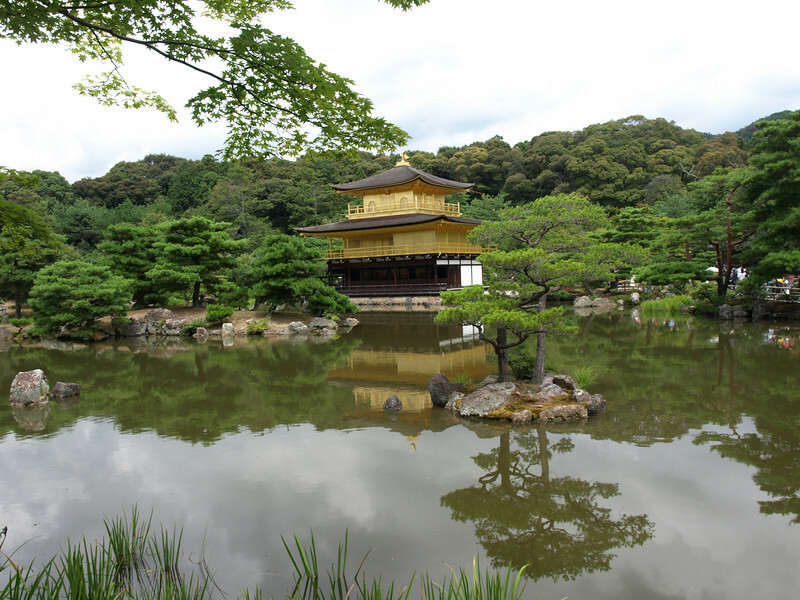 The land on which the Golden Pavilion is built was originally the property of Kintsune Saionji, a prominent figure in the Japanese Imperial Court. 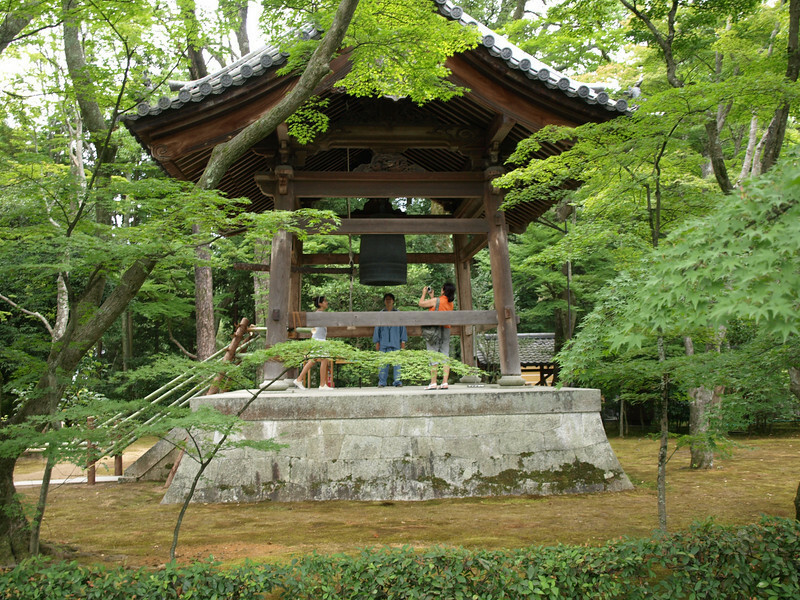 At that time, this bell was owned by the Saionji family dating back to the 1200s. 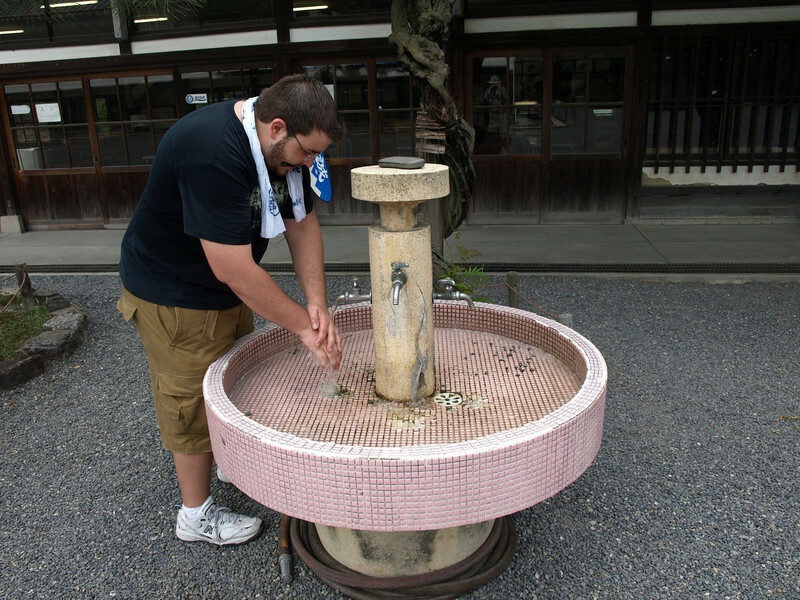 As you can see from the sign, they requested a 200 yen (about 2 dollars) donation to make your prayer. 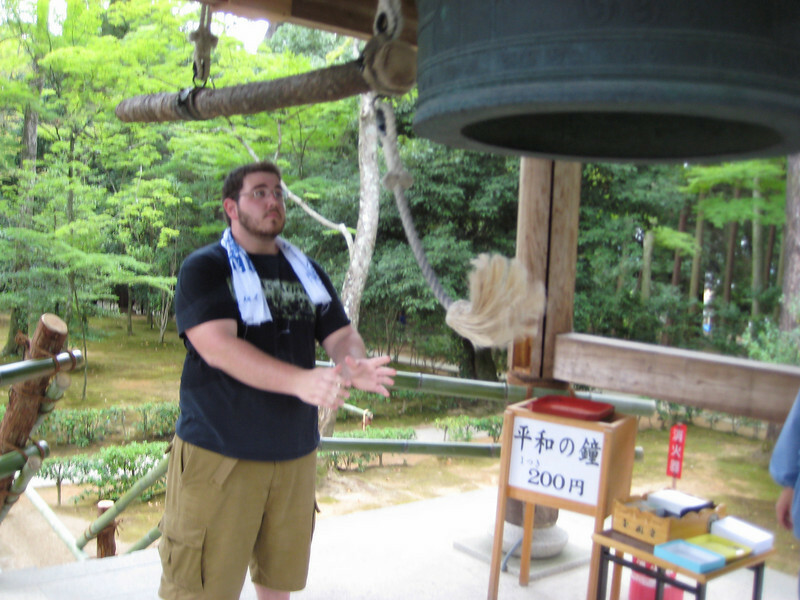 Following the attendant's instructions, Josh swung the rope and then released it just before the shaft struck this 800 year old bell. 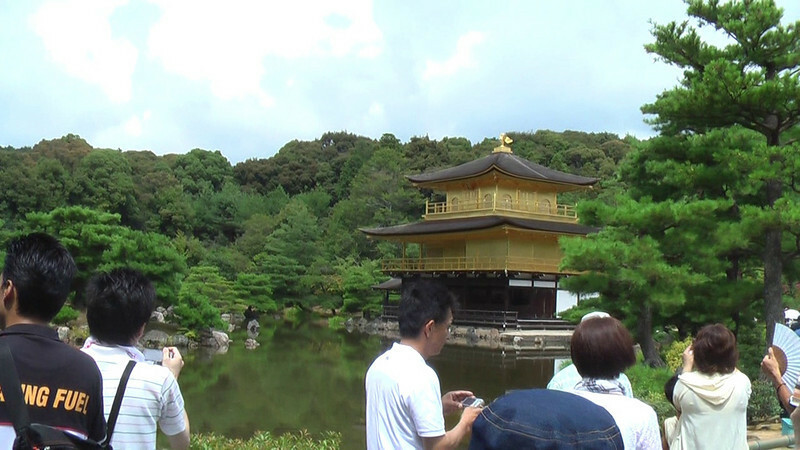 A very brief video of the structure as we walk towards it. 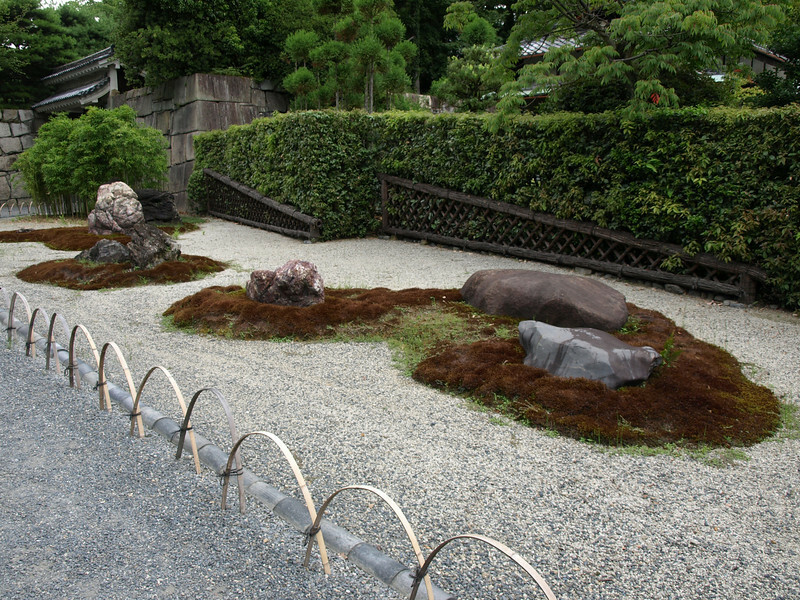 Here is an example of Karesansui, a dry landscape garden. 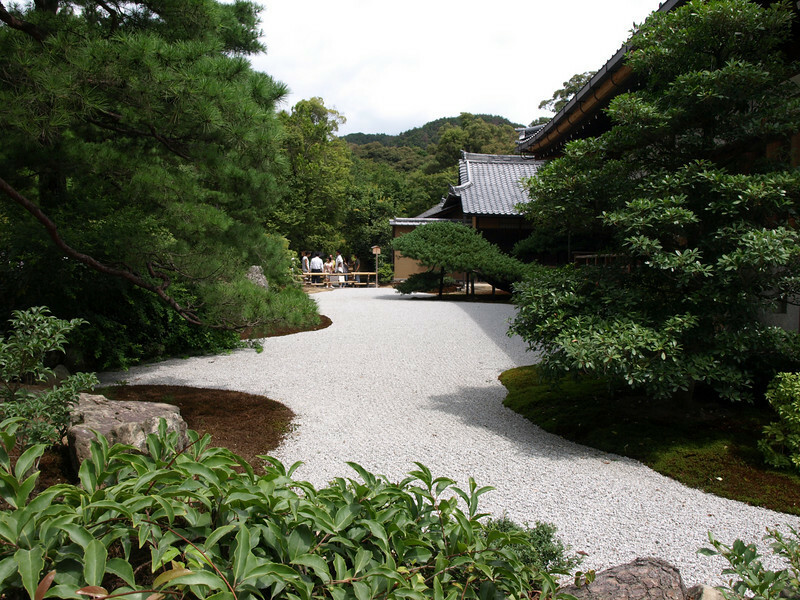 Patterns are raked into the sand which are said to promote peace and harmony in the viewer. 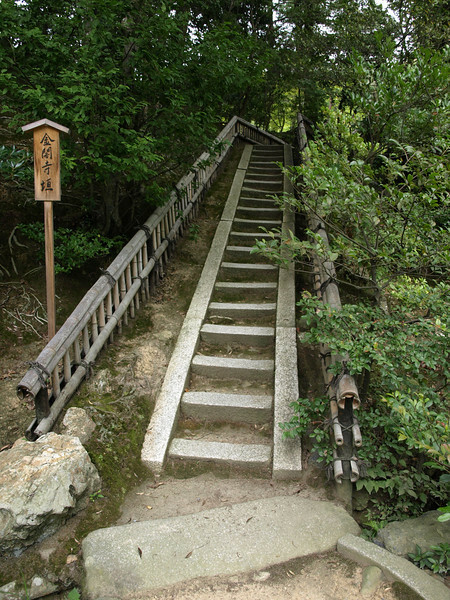 This structure was originally the home of Kintsune Saionji (mentioned earlier in the bit about the bell) in 1220. 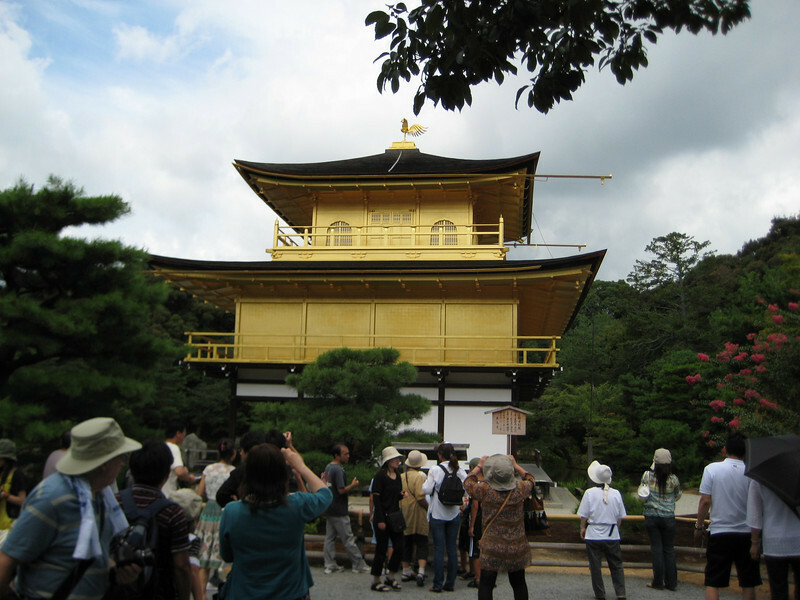 In 1394, it was taken over by Yoshimitsu, the third Shogun of Ashikaga, who rebuilt it into his own retirement home. 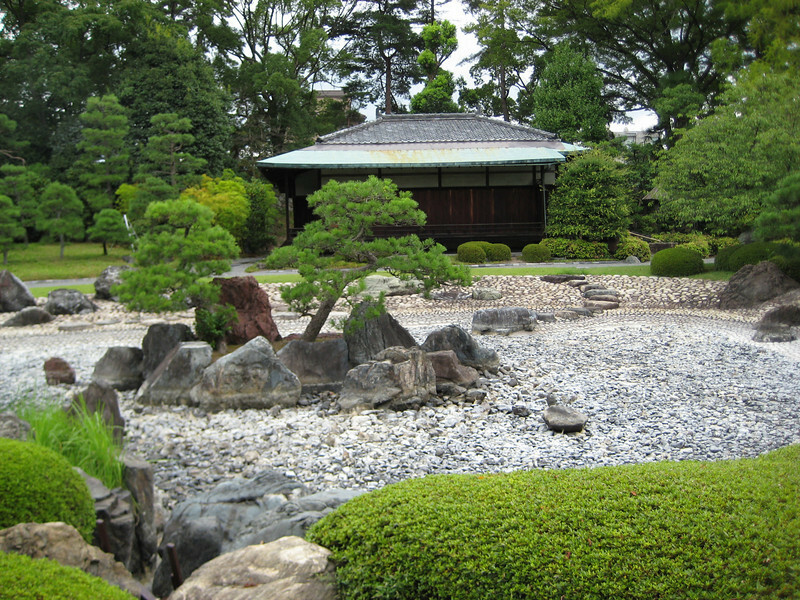 Following the death of Yoshimitsu, the site was rededicated as a Zen temple by his son in accordance with his father’s wishes. 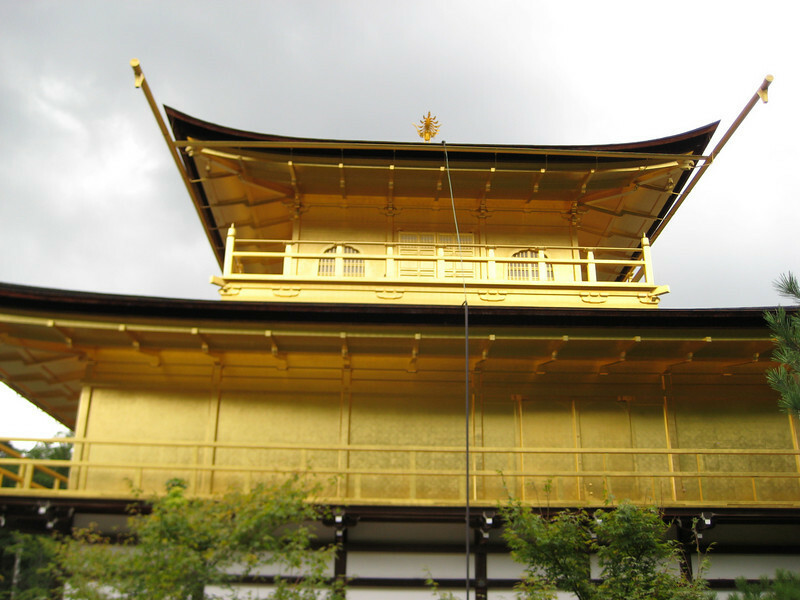 The shogun's wish was to cover the entire building in gold leaf, but was only able to cover the ceiling of the third floor. 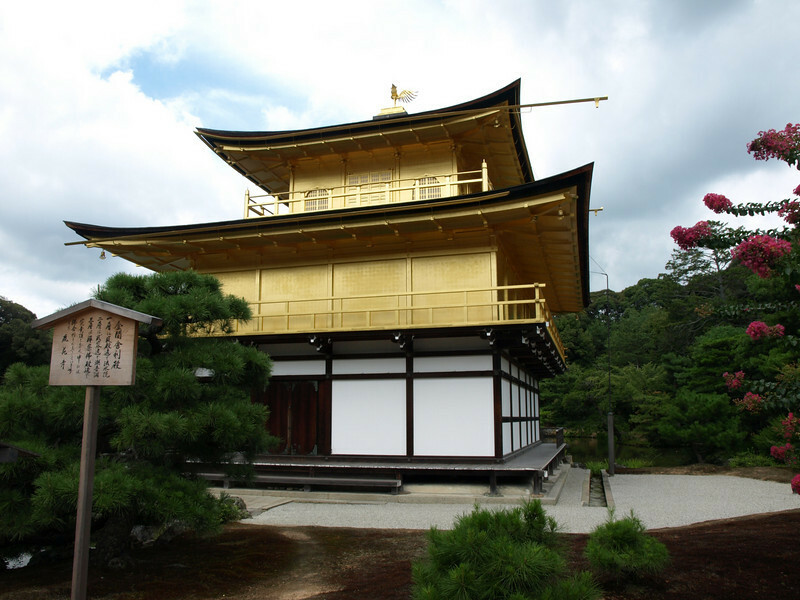 When the structure was rebuilt after it was burned down by a young student monk in 1955, the top two floors were covered in gold leaf to honor the shogun’s wish. I suppose this cable is to protect the building from lightning strikes.